I cannot remember the last time that a movie has so captivated me, that the next day I am still overwhelmingly enchanted by its beauty, its grandeur, and its sense of humanity. Hugo came out late last year, but until last night I knew precious little about it save for some of its cast and that it was directed by Martin Scorsese. And that it was based on a book. And that it was in 3-D. Maybe that was one reason why I didn't see it in theaters earlier, because truth be told I have become exhausted with the 3-D fad. Too much use of it in places where it shouldn't be used at all. After watching Hugo for the first time however, I am kicking myself for not catching it during its theatrical run. I would pay good money just to watch that very first shot of the train station in 3-D, because even on a 2-D high-def television screen it was jaw-droppingly gorgeous! Good readers, I'm gonna choose to not go into a terrible amount of detail about Hugo. This really is a movie that you owe it to yourself to go into as unaware as possible. I mean, there are so darned few surprises in this world these days. Especially, it sadly seems, in the movies. And if you genuinely want to experience the movie the way they once were and could still be again, then you can not possibly go wrong with Hugo. 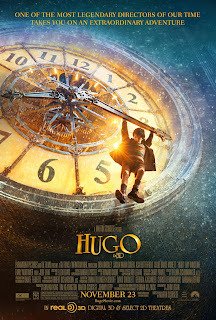 Boasting the finest-assembled cast in recent memory - with Ben Kingsley, Chloë Grace Moretz, Sacha Baron Cohen, Christopher Lee, and Asa Butterfield turning in a wondrous performance as Hugo - this movie is an epic triumph in every sense. Hugo gets this blogger's absolutely highest possible recommendation! I'll be getting the Blu-ray of this for my library for sure... and Lord willing I ever have children, this is one movie that I'm exceedingly looking forward to watching with them. Hugo, along with `The Odd Life of Timothy Green,' are two of the best movies I've seen in years. I recommend both of them wholeheartedly, especially as both are entirely family- and kid-friendly!